Let me introduce you to my absolutely favorite restaurant in Hamburg. The “Hala” is located in the West of Hamburg, in Othmarschen. They offer the most exclusive Lebanese food and drinks you can imagine. 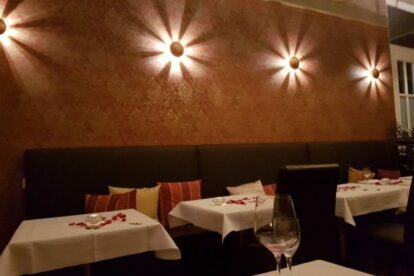 The interior at Hala is an experience in itself. The tables are always set with white linen and decorated with rose petals, lentils and black sesame. You will be shown to your table and the servers will make you feel welcomed and exclusive from the moment you walk through the door. Make sure to order their mezza entré plate. You can either choose nine or twelve different starters. The lovely waitresses will bring the starters and explain in detail what they are made of. When wanting to visit the Hala, you need to reserve a table prior to your visit – not only on the weekends. Even during the week, every table at the restaurant is occupied! Try out “Hala” and be taken into the land of Arabian Nights!